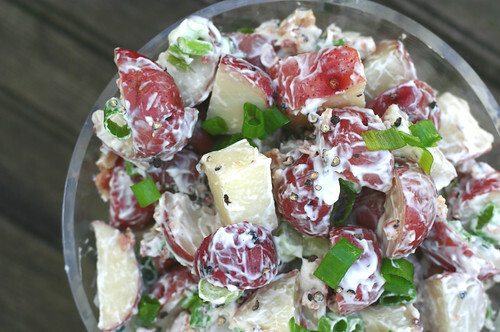 The most amazing potato salad you will ever have! Bacon, green onions and lite mayo mixed in with smoky red skin potatoes. This one is either for serving up at the family reunion (to impress the heck out of the kinfolk), or, to hoard all for yourself. Bring to boil. Turn down heat and simmer for 10-15 minutes until fork tender – NOT MUSHY! Drain immediately and run under cold water until steam goes away. Put in fridge and cool. Mix in cooled potatoes, refrigerate until cool, and serve. Even better if you make salad a day ahead of time and let sit. Oh, I’m SO GLAD you posted the measurements for this wonderful potato salad. I’m always going by guess and by gosh. Nice to have exact measurements! You’re right, it’s the BEST potato salad EVER!! !